What dua' can one say for a person who is sick? For example, a parent for a sick child? Or for any family member or friend who is ill? Or even a dua' for a sick person to say for himself? It was narrated from Abu Sa eed al-Khudri (may Allah be pleased with him) that the Prophet (peace and blessings of Allah beupon him) described Soorat al-Faatihah as a ruqyah, and he approved of the Sahaabi who recited it as a ruqyah for the one who had been stung by a scorpion. - Al-Bukhaari (2156) and Muslim (2201). "There was a time when I fell sick in Makkah, and I could not find a doctor or any medicine, so I treated myself by reciting it. I would take some Zamzam water and recite it over it several times, then drink it. I recovered fully by these means, then I began to do that whenever I felt alot of pain, and I benefited greatly from it." - Zaad al-Ma aad (4/164). 2. "Lord of the Magnificent Throne"
Transliteration: 'As'alullaahal-'Adheema Rabbal-'Arshil-'Adheemi 'an yashfiyaka. Reference: At-Tirmithi, Abu Dawud. See also Al-Albani, Sahih At-Tirmithi 2/210 and Sahihul-Jami' As-Saghir 5/180. 3 ‒ "You are the Healer"
It was narrated from Aa'ishah (may Allah be pleased with her) that when any of us fell sick, the Messenger of Allah (peaceand blessings of Allah be upon him) would wipe him with his right hand then say: "Adhhib il-ba's, Rabbi l-naas washfi anta al-Shaafi laa shifaa ailla shifaa uka shifaa an laa yughaadir saqaman. (Remove the harm, O Lord of humankind and heal him, for You are the Healer and there is no healing except Your healing, with a healing which does not leave any disease behind)." Narrated by al-Bukhaari (5675) and Muslim (2191). It was narrated that Aa'ishah (may Allah be pleased with her) said: "If one of his family fell sick, the Messenger of Allah (peace and blessings of Allah be upon him) would blow over him and recite al-Mu'awwidhaat. When he fell sick with his final illness, I started to blow over him and wipe him with his own hand, because it was more blessed than my hand." Narrated by al-Bukhaari (5735) and Muslim (2192). It was narrated from Uthmaan ibn Abi l- Aas al-Thaqafi that he complained to the Messenger of Allah (peace and blessings of Allah be upon him) about some pain that he had felt in his body since he became Muslim. The Messenger of Allah (peace and blessings of Allah be upon him) said to him: "Put your hand on the part of your body that hurts and say: 'Bismillaah' (in the name of Allah) three times, then say seven times: 'I seek refuge in Allah and His Power from the evil of what I find and I fear.'" - Narrated by Muslim (2202). 6 ‒ "In the Name of Allah I perform ruqyah"
It was narrated from Abu Sa'eed al-Khudri (may Allah be pleased with him) that Jibreel came to the Prophet (pbuh) and said: "O Muhammad, are you sick?" He said: "Yes." He said: "In the name of Allah I perform ruqyah foryou, from everything that is harming you, from the evil of every soul or envious eye may Allah heal you, in the name of Allah I perform ruqyah for you." - Narrated by Muslim (2186). 7. ‒ "Allah Who is in heaven"
It was narrated that Abul-Darda (may Allaah be pleasedwith him) said: I heard the Messenger of Allah (peace and blessings ofAllaah be upon him) say: "Whoever among you suffers some sickness, or his brother suffers some sickness, let him say: 'Our Lord Allah Who is in heaven, hallowed be Your name, Your will is done in heaven and on earth; as Your mercy is in heaven, bestow it upon the earth. Forgive us our sins. You are the Lord of the good. Send down Your mercy and healing upon this pain'; and he will be healed." It was narrated from Ibn Abbaas (may Allah be pleased with him) that the Prophet (pbuh) said: "The one who visits a sick person who is not dying, and says seven times in his presence, 'I ask Allah the Almighty, the Lord of the Mighty Throne, to heal you', Allah will heal him from that sickness." - Narrated byAbu Dawood (3106); classed as saheeh by al-Nawawi in al-Adhkaar (p.180) and by al-Albaani in Saheeh Abi Dawood. While reciting these ruqyahs over someone, for example your sick child, you should wipe your hand over his face, chest and stomach, as the Prophet (pbuh) used to do, and you should sit near your child's head so that you will be breathing over him as you recite the page. There is nothing wrong with blowing lightly onto his face with a little saliva while doing that. Ibn al-Qayyim said: "The ruqyah comes from the heart and mouth of the one who is reciting ruqyah, so if it is accompanied with some of his saliva and breath, that will have a stronger effect." - Zaad al-Ma aad (4/164). 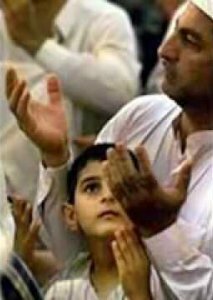 Over and above all that there must be sincerity towards Allah in the du'aa , and sincere turning to Him and humility before Him, and one should seek out the times when prayers are answered, for when a person raises his hand to Allah in du'aa, Allah is reluctant that the person should remain empty-handed. Do not be hasty in seeking a response, for Allah may delay the answer for a reason that is known to Him, so you should be patient and have certain faith. Remember that the Prophet (pbuh) said: "Call upon Allah when you are certain of receiving a response, and remember that Allah does not answer a du'aa that comes from a heedless heart." Narrated by al-Tirmidhi (3479);classed as hasan by al-Shawkaani in Tuhfat al-Shaakireen (68) and byal-Albaani in al-Silsilah al-Saheehah (594). My mom is suffering frm paralysis and recovering slowly but her diabetes is not getting in control which Dua shld i read n blow on her. May Allah heal your mom and give her comfort in this life and in the hereafter. She asked for a dua, all you did was made her lose hope. Allah can cure Autism in ways yo know not for Allah is the All - Curer. Trust me, there are so many people that were told they have few days to live but alhumdiuallh they are living for over 20 years. A few hours ago, I woke up to screams that my 6 year old precious sister was having a seizure and couldn't talk. Her eyes were crying for help but.... she just couldn't talk. Im in shock. You don't know how much I love her. She means everything to me. Please keep her in your prayers and INSHALLAH everything will be okay. Everyone please pray for my grandmother. She is really sick and weak. She cant walk, eat or drink properly. She is very nausous. Doctor checked her, everything was fine. But doctors found small tumor/cyst kind of thing in her liver. Today she had a CT scan, only then doctor can understand what has happened, whether it is small cysts which can be treated by medecine or whether if its cancerous. I cried a lot these days. She cant eat or drink properly. She cant even walk without help. I really hope and pray so if the results are positive. Please everyone do pray for her so if her results come out positive and she gets well soon. Allah is the best. Assalamu alykum i humbly request from all muslim brothers and sisters in islam , please make dua for Saleh, one of islami bro that he lost in yemen war from one year, his famly s in bad condition i request u all please for Allah's sake pray for him for his saftey and return,back ...in sha Allah .. please!!!! JazakaAllah khairan .. May Allah grant all of your prayers aameen. Assalamualaikum, my dad jus had a bypass surgery to his heart surgery went well but now he was place back o to the ventilator because of his breathing and hus blood pressure and he has decareas amount of urine plz help me aith a dua for him. Please make duaa for my father. He is critically ill and in coma. My 10 month old brother ate my mom’s very powerful medicine that he found on the floor and he just got rushed to the ambulance. Please make dua for him. My family is going crazy and my dad was screaming at my mom and my mom has a heart problem. Please make dua for my family. I ve pcos will any one marry with this disease i'm so much worried what should i do ? Salam alaikum, please make dua for my father, syed shah he has been very sick lately, he has been very dizzy and has a lot of Gastrointestinal issues as well as headaches , he can’t eat much food ... I have also been having a lot of health issues myself, & ontop of that i suffer from severe depression and anxiety. I am having a hard time getting through my days. I’m only 24 years old, I really really need all your prayers! Please make Dua for me and my father to recover Ameen. Thank you all so much. God bless you all. My brother has gotten into a crash. His brain is swelling and he is unresponsive. It might be likely that he will have brain damage or that he might die. Please, send as many Duas as possible to help. My best friend/brother and family needs help. Thank you so much, my dear brothers and sisters. My fiancé is suffering from arthritis and having join pain all over his body and Dr recommended him bedrest or he has to undergo for a surgery. Which dua he can recite to relieve his pain as well as to ask forgiveness.